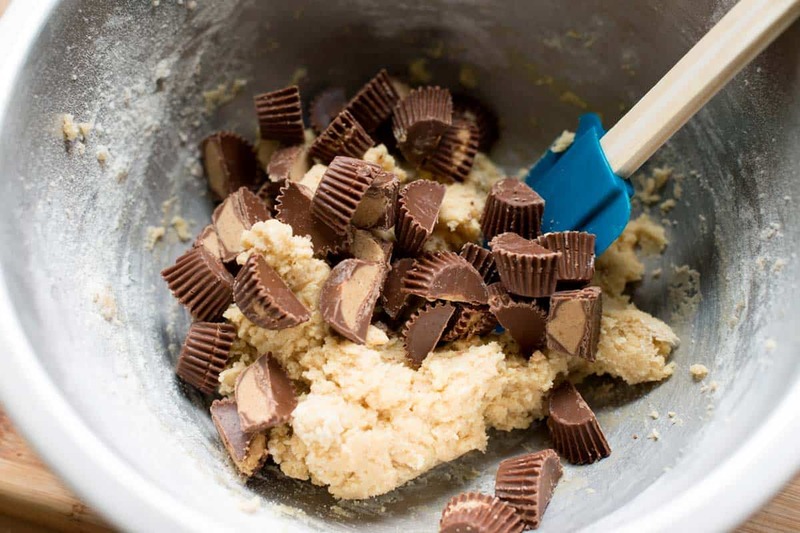 How to make soft and chewy bar cookies with peanut butter cups (or your favorite candy) from scratch. Jump to the Easy Bar Cookie Recipe or read on to see our tips for making them. Somehow, we’ve collected an odd assortment of miniature candy bars. We’ve literally got half-empty bags pushed into every nook and cranny of our pantry. A few of those bags had one of our favorites, Reese’s peanut butter cups. 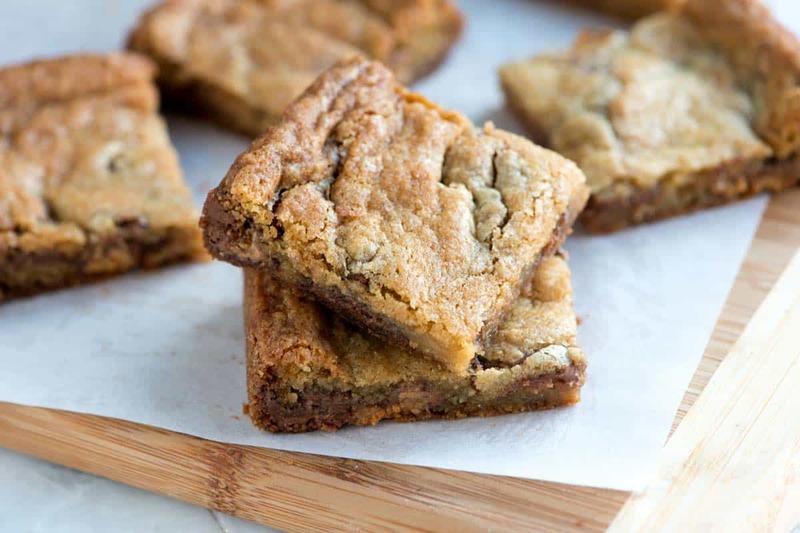 This soft, tender and easy bar cookie recipe was the perfect way to use them. YOU MAY ALSO LIKE: These Milky Way Stuffed Cookies. 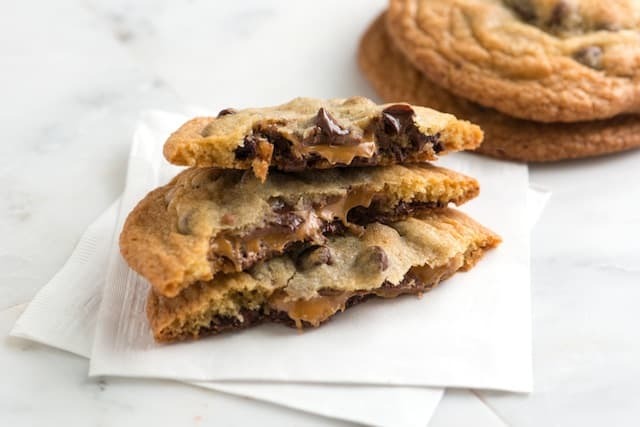 By sandwiching a Milky Way between two layers of cookie dough, the cookies have a chocolate and caramel center. A must make! This cookie dough is versatile and can be used 100 different ways. We absolutely love peanut butter cups. Especially the miniature ones — they have the perfect peanut butter to chocolate ratio for us. If you have another favorite — Snickers, Milky Way Bars, or other candy, use it. They work just as well. The cookie dough comes together in minutes — beat butter and sugar, add egg, and then the dry ingredients. Soft, tender, chewy bar cookies! 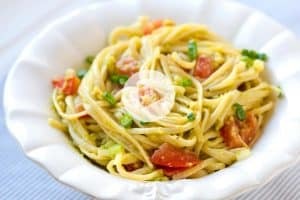 So easy and oh, so delicious! WATCH: If you’re up for making your own candy, take a look at our recipe and video showing you how to make Salted Chocolate Covered Caramels. This soft, tender and easy bar cookie recipe is the perfect way to use your favorite candy bars. We love peanut butter cups, but most candy will work for this. 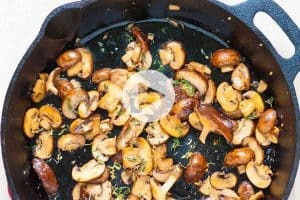 Heat oven to 350 degrees F. Line an 8-inch or 9-inch square pan with parchment paper then lightly spray with non-stick cooking spray or grease with butter. 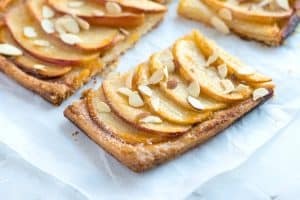 In a large bowl, beat butter, both sugars and the vanilla extract on medium speed with a hand mixer until creamy, light, and fluffy, scraping down the sides as necessary; about 3 minutes. Add egg and beat until combined. Add the flour mixture, in thirds, to the butter mixture, beating until incorporated and scraping down the sides of the bowl as necessary. Stir in the halved peanut butter cups. Press cookie dough into baking pan and bake until the top is no longer wet and is golden brown, 20 to 30 minutes. Cool then cut into 12 rectangles. Make Ahead: Refrigerate unbaked cookie dough up to 3 days. Disappointed. Looked like a variation on chocolate chip cookies but turned out dry and rather flavorless though I cooked it the minimum time. (I use a temperature gauge.) Peanut butter cups in it did not shine through. Needed to make a chocolate glaze and crumble more peanut butter cups on top to try to save it. Won’t make again. Hi Tess, We are sorry the bar cookies didn’t work well for you. Adding more peanut butter cups could be an option for next time. I love your idea of a glaze at the end! How do you adapt this for use with full size Reese’s peanut butter cups? We don’t have any of the minis, but lots of the full size cups. Hi Patricia, You’re looking to add 1 1/2 to 2 cups of chopped candy. I’m not 100% sure how many larger peanut butter cups that will require, but I’d guess 4 to 6? Plan on making today for Easter! Having family over. My daughter is pregnant and loves peanut butter and chocolate. Really, pregnant or not, who doesn’t love pb and chocolate?! I’ll let you know what I think….. 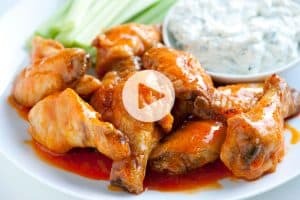 I love your recipes and would like to subscribe. I made a Pregnant Woman melt with these. My younger sister is Preggos so I was able to occupy her five year old twin boys (they me make the cookie bars) and make her a delectable treat. Cookie (Brownie) points to me. I love cookies and these are a great idea when you don’t have time to do batches. 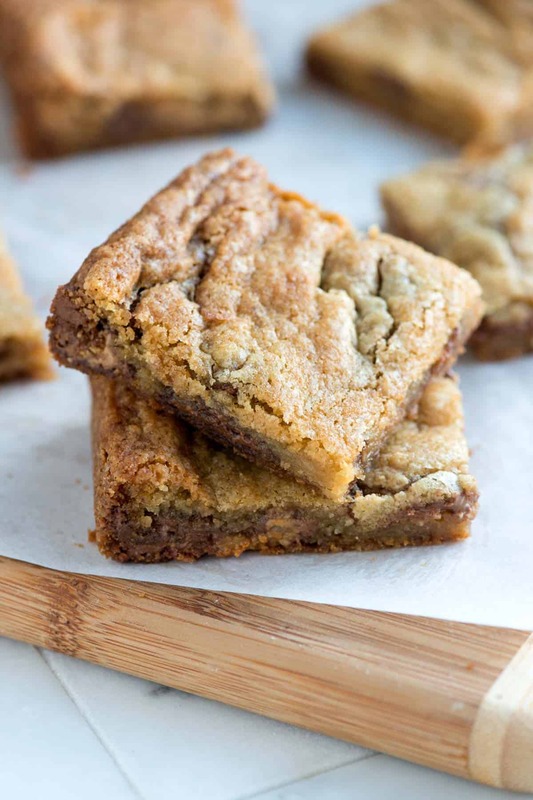 Like your no-fail blondies — which my family loves — these are going to be on my favourites list. Thanks for sharing your amazing recipes! Made these tonight, big hit and we used some of our Halloween candy, thank you! I love the simplicity to this! Looks awesome!